The official source of the Thames lies in a remote Gloucestershire meadow on the edge of the small village of Kemble. Ordnance Survey map reference ST980994 to be absolutely precise. This area is officially known as Trewsbury Mead but is sometimes referred to as Thames Head. One hundred and eighty four miles of the River Thames stretch out between here and the Flood Barrier at Greenwich. It is a daunting thought. Looking on the bright side I am standing here at a height of 361 feet above sea level so in theory it should be all downhill from here. Up until 1974 the statue of “Old Father Thames” himself would have welcomed visitors to the source. He has since been moved to a more accessible location at St. John’s Lock and I will be making his acquaintance in two days time. Not everyone is in absolute agreement that this is the true source of the Thames. The Ordnance Survey and the Environment Agency both give Trewsbury Mead as the official source, but there is a small rival faction that argues that the source is at Seven Springs, approximately eleven miles to the north of where I am standing. A look at the map reveals that Seven Springs is marked as the source of the River Churn which is only regarded as a tributary of the Thames and joins with the main river just below Cricklade. Both rivers have had their names since earliest recorded history and there seems little cause for the argument. The Churn has given its name to the villages of North and South Cerney, and also to the town of Cirencester which was known to the Romans as Corinium. Just as some people will continue to argue that the world is flat so they will dispute the source of the Thames from time to time. All that be as it may, but the map says that the source is here, the stone is here, and I am here. The only snag is that there is just no sign of any water here. Despite the recent rains the first part of my journey is along a dry depression in the field. The headwater springs can apparently come instantly to life after particularly heavy rainfall and at such times this bowl has been known to flood very quickly. There are tales that in Victorian times one only had to jab a stick into the ground anywhere in this field to be rewarded by the release of a spurt of spring-water. Within a few hundred yards the shallow depression noticeably transforms into a dry river bed, but it takes almost 10 minutes of walking before a puddle appears. This is it, the first water of the Thames. Away I go! Only a few yards later I am following what I can only describe as a shallow reed-filled ditch, but in the space of only a few minutes this undergoes a rapid metamorphosis into a sparkly clear stream running under a simple stone footbridge. This is the first of many bridges ending with the distinctive shape of Tower Bridge that will provide me with handy marker points along the pathway. Shortly afterwards the first road bridge appears and sweeps the fledgling waterway under the lane and across the fields on its journey to the sea. I follow the river with a bright spring in my step, enjoying the first stage of my expedition. It is a delightful spring morning and the weather forecast for this weekend is ideal. Sunshine with a light breeze to cool me from my exertions will make this an ideal opening day. The people at the Met Office are not so optimistic for the remainder of the week and are predicting persistent rainfall from Tuesday. The first village I come to on the river is named Ewen, which means “source of a river”. 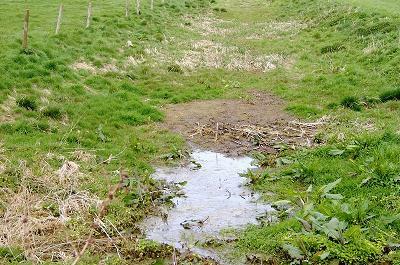 I have been walking for some while now, but the subject of my mission is merely a small infant stream carrying only a few inches of water and is still not much more than a ditch. At Ewen I discover the first water-mill on the river. It seems incredible to think that a mill could operate with such a tiny water flow, but years ago before the water-table fell to its present level operate it surely did. In many places the river is so small that it could be jumped over with ease if I so wished. However, as field after field goes by wider pools appear and the depths are increasing. Butterflies and insect life abound and a peaceful air prevails. A swan’s nest complete with a pair of mute swans is half hidden among the reeds on the opposite bank. The sun reflects off newly formed leaves and the occasional patch of early yellow rapeseed adds a variety to the distant greenery. The English countryside is in its full glory.